Here’s a fuzzy Quatchi hat! It’s designed by Portland’s Terri Larson, and available through the Olympics’ online store. Happy Worker has a line of mascot vinyl figures, including a creepy ghost Quatchi that you can paint whatever color you want. I’d friggin’ love to have this full-color set. 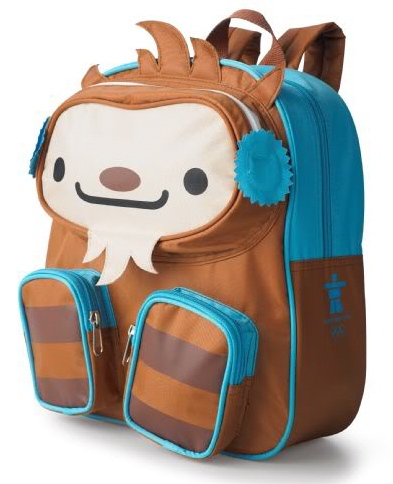 I don’t know why, but this nifty Quatchi backpack (above) is no longer listed at the online store. 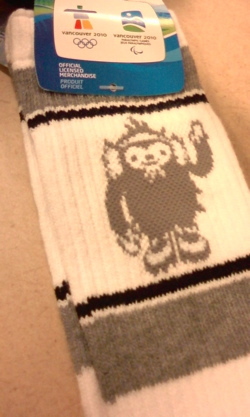 And something I’ve never seen listed anywhere are these Quatchi socks, as photographed by StevieMacDonald — thanks! She got them at Aritzia in Toronto. I’d like a pair for myself, so I’ll check their store near here in in Bellevue. For those who missed it the first time, here’s Quatchi Merch Roundup #1. 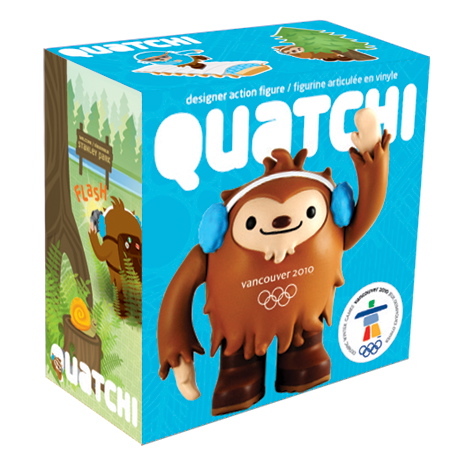 This entry was posted in Uncategorized and tagged merchandise, Quatchi. Bookmark the permalink. I love all the Quatchi stuff, but there’s no where in the US to buy any of it. 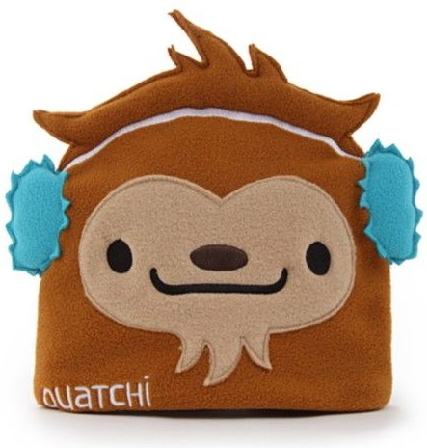 Although I did get a Quatchi plush for Christmas, I’d love those socks and the toys are pretty amazing (and not available online at all). Gah! That hat is SO cute, OMG! I want it, I want it, I want it! …For kids, though? 😦 Probably won’t fit my head. I want that vinyl figure, too.